Just Add Love is an overtly feminine and effortlessly beautiful collection inspired by the universe theme of love. 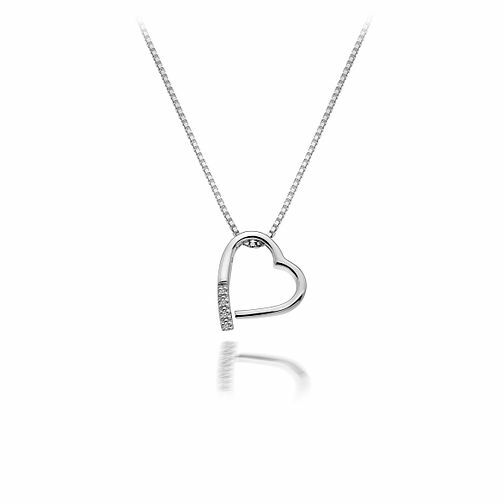 Crafted from 925 sterling silver, this open heart pendant measures 15mm in height and features a stunning row of three real one point diamonds. Included with our 40-45cm 925 sterling silver box chain. Hot Diamonds Open Heart Angle Pendant is rated 4.4 out of 5 by 5. Rated 4 out of 5 by Anonymous from Sleek and glamorous without too much fuss Excellent heart shaped necklace,bought as a gift. Looks very elegant and sits beautifully on the chest as was bought as a gift. Sometimes less is more, and with a lovely bit of sparkle!!!! Rated 5 out of 5 by Anonymous from A Heart of True Love I was searching for something meaningful to give to my mom as a Christmas + birthday gift, and when I came across this one it felt like it was the perfect one! With the heart meaning of our love for her and the diamonds meaning of how precious she is to us, I am beyond happy with this purchase. Moreover, I also requested a gift wrapping and it was really really cute! !